This traditional rump strap is one of a pair. 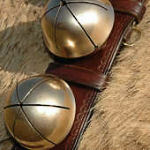 It features six antique traditional Swedish bells on a straight, lined strap. The strap is made of dark brown bridle leather about 24" long and 3" wide with a decorative border stamped around the edges. We installed a dee on each end and a pair of dees along one side so the strap could be securely tied to the back of a riding saddle or onto a harness.